A short loop track in the Earl Mountains. U Pass • By gavins. Licence: cc by-sa. Car park at "Earl Mountains Tracks" sign, just north of Eglinton Flat, SH94. 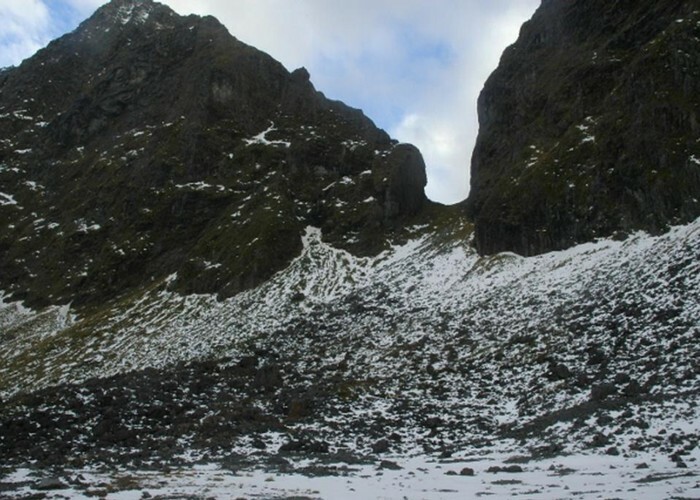 Both Hut and Mistake Creeks are good day or overnight journeys from the Milford Road, with tracks as far as the bushline and straightforward walking up valley beyond. U Pass is located on a spur of the main ridge of the Earl Mountains, and a crossing of this pass will link the two valleys. The best route is up Mistake Creek due to the waterfall section. Consult Moir's Guide South for details of navigation around the waterfall. From the car park, cross the Eglinton River on a walkwire and turn sharp right to take the Mistake Creek route. Follow the marked track up the true left of Mistake Creek, crassing after about 1.5 hours. The track continues as far as the valley and creek leading down from U Pass. Follow this creek on the true right, and work your way up the true right bank of a waterfall. U Pass is an obvious notch directly ahead, with a quick descent down to the Hut Creek flats. A track follows the true left of the creek down, crossing over eventually to the true right, then crossing Mistake Creek and returning to the walkwire.